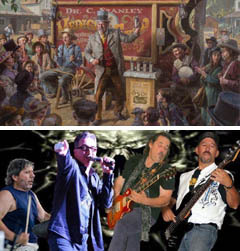 Doctor Magkneetoe is a classic rock band that has been preforming in and around the Hudson Valley for two decades. The band consists of veteran musicians from the region playing the best of classic rock, Motown and a variety of feel-good songs and old-school rock. The Ceesar Band has been playing some of the best classic rock in the region over the last seven years, covering artists like Led Zeppelin, David Bowie, Pink Floyd, Steely Dan, The Beatles, The Who and Queen, to name a few. The band plays with such an infectious energy that you can’t help but get pulled into the music. Bernie Servodio’s vocals have the ability to capture the quality of whoever he is covering, as well as adding his own personality to it. Billy Beehler's guitar work has an intensity that can send chills through you. George McGann on bass and Dave Mucci on drums lay down a perfect foundation for everything to ride on. All members handle background vocals that round out the sound of the band. On occasion they’ll treat the audience with The Music of David Bowie for a set.